Dutta, A., Ullah (Bangladesh), S. (2016). Simulation of the Performance Parameters and Carrier Concentration Profile of Poly 3-Hexyl Thiophene/Phenyl-C61-Butyric Acid Methyl Ester Planar Hetero-junction Photovoltaic Cell. Iranian Journal of Energy and Environment; previously called: Iranica Journal of Energy & Environment, 7(4), -. A. Dutta; S.M. Ullah (Bangladesh). "Simulation of the Performance Parameters and Carrier Concentration Profile of Poly 3-Hexyl Thiophene/Phenyl-C61-Butyric Acid Methyl Ester Planar Hetero-junction Photovoltaic Cell". Iranian Journal of Energy and Environment; previously called: Iranica Journal of Energy & Environment, 7, 4, 2016, -. Dutta, A., Ullah (Bangladesh), S. (2016). 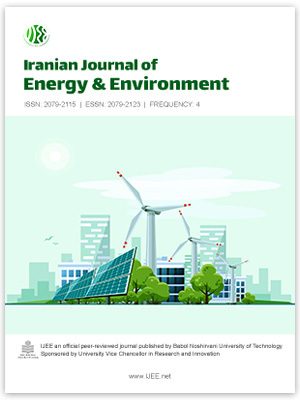 'Simulation of the Performance Parameters and Carrier Concentration Profile of Poly 3-Hexyl Thiophene/Phenyl-C61-Butyric Acid Methyl Ester Planar Hetero-junction Photovoltaic Cell', Iranian Journal of Energy and Environment; previously called: Iranica Journal of Energy & Environment, 7(4), pp. -. Dutta, A., Ullah (Bangladesh), S. Simulation of the Performance Parameters and Carrier Concentration Profile of Poly 3-Hexyl Thiophene/Phenyl-C61-Butyric Acid Methyl Ester Planar Hetero-junction Photovoltaic Cell. Iranian Journal of Energy and Environment; previously called: Iranica Journal of Energy & Environment, 2016; 7(4): -.